Dunaskin Mill is perched on top of the Kelvin River with some beautiful scenic views and a charming outdoor courtyard, the perfect sun-trap for those sunny days. Dunaskin Mill is located on the site of the former Scotstoun Mill. Only a 5 minute stroll to the UNIVERSITY OF GLASGOW and even closer to GLASGOW INTERNATIONAL COLLEGE and the KELVINHALL SUBWAY STATION. 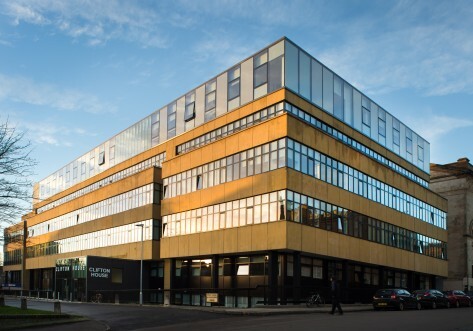 The city centre is just a 10 minute bus journey with very quick access to the UNIVERSITY OF STRATHCLYDE – making it the ideal location if you’re studying in Glasgow! It gets better – there is a huge choice of rooms available from EN-SUITE rooms in shared apartments, to your very own en-suite STUDIO. There are a great choice of different room sizes to suit all tastes and budgets. We even have amazing TWO BED APARTMENTS that are perfect for sharing. Whichever type of accommodation you choose, you will have a comfy SMALL DOUBLE BED, STYLISH DECOR, plenty of WORK SPACES and loads of STORAGE too. 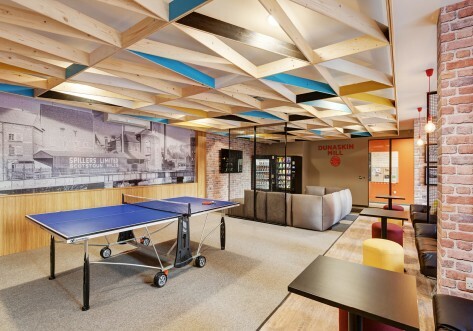 There are 4 awesome SOCIAL SPACES to enjoy. So you’ve always got somewhere to meet up, mingle or get your head down to study. We have added a MEGA 100Mbps BROADBAND with Wi-Fi too, which means you can use your smartphones, tablets and laptops wherever you are in the building! We have also included a laundry room, GYM and a bike storage to make everything a bit easier. Dunaskin Mill is located on the site of the former Scotstoun Mill. Only 5 minutes stroll to the UNIVERSITY OF GLASGOW and even closer to GLASGOW INTERNATIONAL COLLEGE and the Kelvinhall Subway Station. 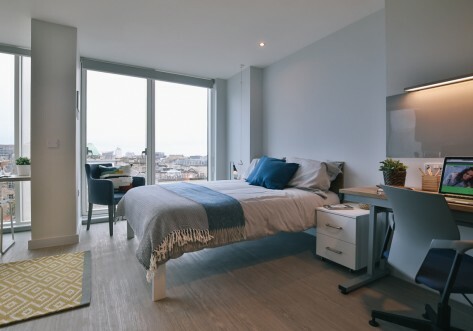 The city centre is just a 10 minute journey away and very quick access to the UNIVERSITY OF STRATHCLYDE by bus too – making it an ideal location if you’re studying in Glasgow! Great affordability with a small double bed alongside your own en-suite shower room, ample storage and space to cook and enjoy your own meals in the shared kitchen/living room. Rooms are approximately 14m2 and located on the Ground Floor. Enjoy apartments built especially for two! The two study bedrooms, with small double beds, share the fully-fitted kitchen/living areas and high spec bathroom. Perfect for pals wanting their own apartment. Our more spacious apartments, on a higher floor, are built especially for two. The two study bedrooms, with small double beds, share the fully-fitted kitchen/living areas and high spec bathroom. Perfect for friends looking to share an apartment. All our usual fab features – with a small double bed alongside the en-suite shower room, ample storage and shared kitchen/living room. Rooms are approximately 14m2 and located on floors 1-6. The same fab features as the Silver- with a small double bed and en-suite shower room, plus storage aplenty. Then off to the shared kitchen and social space when feeling peckish with more kitchen space per person. Rooms are approximately 14m2 and located on the top floor. Bigger than Silver, and on a higher floor, comes the joy of sharing in this striking two-bed apartment. Our biggest two-bed apartment! Yet higher still, the view keeps on getting better but all the great facilities are what you expect from us but with more space to move around. Self-contained studio living starts here for you and perhaps your plus one. 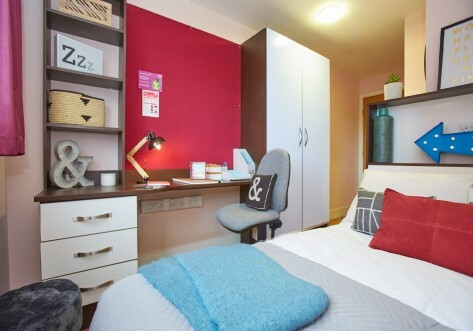 If you choose to share the en-suite shower room, double bed, bags of storage, fitted kitchen and study area, there’s no more to pay for couples. If you like to spread out, then this more spacious studio could be for you. The top notch facilities feature an en-suite shower room, small double bed, storage, fitted kitchen and study area. This beauty of a studio, even bigger than the Silver but with the same quality features and fittings, comes with space guaranteed. Ideal if you’re flying solo and like to spread out or there’s room enough for couples to share at no extra charge. Go Platinum and we’re really giving you space to do your thing. Still treated to the en-suite shower room, small double bed, oodles of storage, fitted kitchen and study area but now with so much more space to enjoy them. More than enough room for couples to share and the price doesn’t change if you do come as a pair. There’s nothing wrong with wanting to keep the best of the best all to yourself. But move fast as we don’t have many, and its no surprise as you get your own bedroom, separate living area/kitchen and en suite bathroom. Check our website for our latest offers.